Growth Habit: Erect plant 700 mm to 1.5 m tall, with more or less horizontal branches from the base and along the length of the stems. The Stems are circular or oval in cross section with shallow longitudinal grooves, solid and have sparse fine hairs, particularly on the upper stems. The stem is frequently reddish in colour though the colour may develop on one side only. Lower stem leaves are 70 to 90 mm long with a petiole some 50 mm long, and are hairless. The leaves developing at the top of the stem are smaller and more elongated. Type of plant: An annual plant, with germination occurring mostly in spring. The plant does not form a rosette. Flowers: The inflorescences are both terminal and axillary, consisting of large numbers of flowers packed tightly into bristly conical spikes. The individual flowers are 2 to 3 mm in diameter, sessile, and green with five petals. Fruit/Seed: Numerous small brown seeds are released throughout summer and autumn. 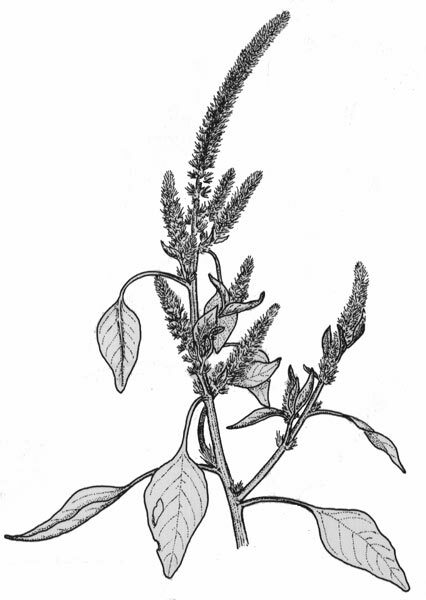 Dispersal: Amaranthus is spread entirely by seed. Seeds are small enough to be moved short distances on wind, water and in soil movement. Distribution: Amaranthus occurs in most parts of the State. It is principally a weed of stock yards, waste areas, orchards, and hop gardens. Status: Amaranthus powellii is not a declared weed under the Noxious Weeds Act 1964. 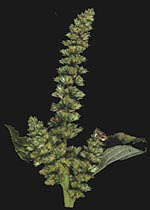 Weed Impact: Amaranthus is usually a weed of run down or neglected areas. It seldom survives in well managed grazing land. It is a significant weed of annual crops, and occasionally becomes a problem in perennial crops. Control Methods: Small infestations can be physically removed with hand tools. Thorough mulching will reduce the presence of amaranthus in home gardens. Mechanical cultivation may be useful on larger infestations, however this must be carried out before flowering, or viable seed may still be produced. A range of herbicides are registered for use on amaranthus in Tasmania including glyphosate, simazine and prometryn.